SynthMaster 2.8 marks another huge step up for this already superb instrument. Drag and drop support. More versatile than ever before. Version 2.7 of KV331's mighty semimodular added new filter algorithms and enhanced oscillators. SynthMaster 2.8 brings in another raft of impressive add-ons that existing users will be amazed they don't have to pay for. For us, the most exciting changes have been made to the modulation system. For starters, it now supports drag and drop: click a modulator name and drag it to a target control to make the assignment, which shows up automatically in the mod matrix. Adjustable modulation depth rotaries appear around all controls assigned to the currently selected modulator, although there's no option to view multiple modulations at once, à la Massive. Modulation assignments can now include a Via source, and active mod source tabs are shaded grey and shuffled to the left end of the row for easy access. The new Dual LFO mode lets you mix between two shapes, and incorporates a bit depth control for dialling in digital stepping; while the ADSR envelope's Analog and One-Shot modes enable faster, smoother envelope movement and bypassing of the Sustain stage, respectively. SynthMaster 2.8 introduces four new ZDF types: the Moog- style Ladder, the 303-style Diode Ladder, the SEM-style State Variable, and the MS-20-style Bite. They're 'inspired by' rather than actual models, but all of them sound great, significantly upping the synth's versatility. The Effects section has been boiled down from three tabs to one, with new displays for Phaser, Chorus and LoFi; and modules can now be reordered by dragging. The arpeggiator's new DrumKit mode serves as a step sequencer for programming an included multitimbral SFZ drum kit, and MIDI input can be recorded into the step sequencer. Polyphonic expression is supported, and you can now choose separate real-time and offline Engine Quality settings. Last but not least, Windows users get a standalone version of the synth. 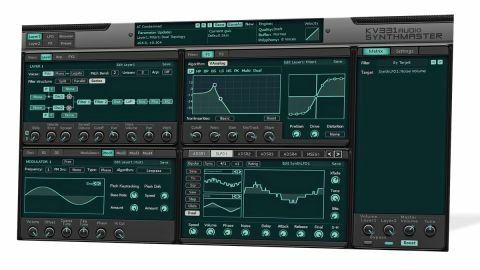 SynthMaster 2.8 marks another huge step up for this already superb instrument, pushing it even further it in terms of sound, flexibility and functionality. As with v2.7, there are a few very minor bugs in evidence, but we expect those to be squashed quickly and they don't detract, anyway, from what can only be described as one of the very finest soft synths money can buy.